Living Area 7,642 Sq. ft. 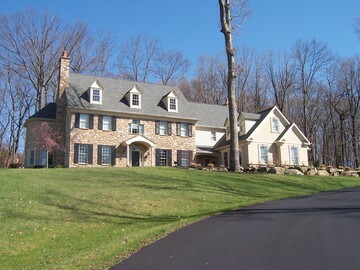 Located amidst the rolling green hills & woodlands of Solebury Township, situated on 3.55 acres of prime land in New Hope's premier community, Partridge Hall Preserve, this custom built 5 bedroom, 4 full & 3 half bath estate home was hand crafted by County Cork Builders just 4 years ago! Enter into a dramatic 2 sty foyer w/hardwood flooring & extensive molding. To the left & to the right are FLR & FDR w/hw flr, crown mldg & FPL in FLR. The gourmet KIT features a center island design w/granite cts, premium appliances & a sun drenched Brkfst Rm. A beautiful Family Rm w/Stone FPL, Library w/FPL, bar area, Butler's Pantry, 2 PRs & 3 car garage complete 1st Flr. 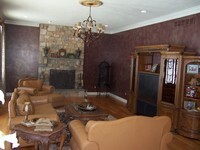 Above are 5 spacious BRs & 4 full BA's including an oplulent MBR Suite w/FPL, Sitting Rm & luxurious BA. Below is a finished Walk-Up Bsmnt w/PR, Movie Theater, Office, Game Rm, Exercise Rm, Play Rm & plenty of storage. Walk-up Attic, Custom Patio, Professional Landscaping & Breathtaking Views make this property truly special!